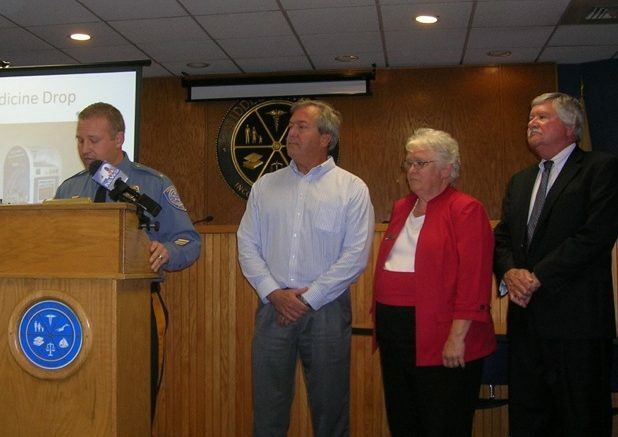 The Middle Township Police Department, in partnership with Cape Assist, held a press conference September 30 to introduce a new program involving a New Jersey Drug and Alcohol Counselor to serve as a Public Advocate in Municipal Court. Police Chief Christopher Leusner said drugs had become a serious problem in Middle Township with drug dealers selling narcotics to students in the 6th, 7th and 8th grades. He noted there were 104 drug overdoses and 25 drug-related deaths in Cape May County in 2014. It was pointed out that many of those who become addicted turn to crime to obtain money for narcotics, stealing from stores, family and friends to feed their addiction and, when arrested, often wind up in prison. The absence of any resources available in Municipal Court often leaves defendants, family members and even the judge with few options regarding treatment or assistance. In the program introduced by Middle Township, involving the Police Department, Municipal Court and Cape Assist of Wildwood, NJ, a Public Advocate will be present in Municipal Court to assist defendants suffering from addition, their family members, the municipal prosecutor and the judge to provide information about available treatment programs. Provided by Cape Assist of Wildwood, the Public Advocate will also serve as a resource for the Middle Township Police Department in providing information about treatment programs to individuals who need assistance and information regarding substance abuse for themselves, a friend or a loved one. Middle Township's Public Advocate Program is the second program of its kind in the State of New Jersey and was inspired by the Gloucester Township Police Department's PROJECT SAVE. In the press conference's question and answer session, veterens advocate Joe Griffies, co-host of the "Welcome Home Show" on WIBG Radio, said "The only way to stop drug usage is to arrest the drug dealers. If someone is caught selling drugs to a teenager, they ought to receive a mandatory 20-year sentence." He also suggested that the Veterans Court in Philadelphia could serve as a model for New Jersey. That court handles the problems of veterans who are arrested for drugs or alcohol and helps them avoid getting involved in the criminal justice system in Pennsylvania. "When veterans are arrested," he said, "they are identified on their drivers license as a veteran and are immediately offered the opportunity to go to a Veterans Court. This starts the process of helping the veteran to avoid prison and get his life back on track. This program has proved to be 98 percent successful — with the veteran never returning to the criminal justice system." He noted that the Veterans Court program operates in cooperation with the Veterans Administration.